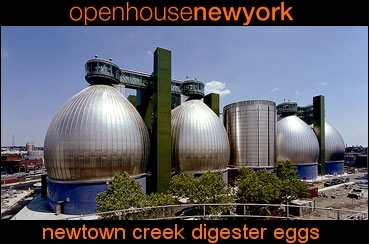 As part of openhousenewyork Weekend, DEP is pleased to invite you to visit the the Newtown Creek Wastewater Treatment Plant digester eggs. Between 11:00 a.m. and 1:00 p.m. there will be organized visits to the top of the eggs. Greg Clawson, project manager from Polshek Partnership Architects and Jim Pynn, plant superintendent, will give talks on the form and function of the plant. Each visit will last approximately 30 minutes and be limited to 20 people on a first-come, first-served basis. The public is also invited to preview the Visitor Center at Newtown Creek as well as the nearby Nature Walk. As part of openhousenewyork weekend, come and explore the first public waterfront access to Newtown Creek. This quarter-mile nature walk offers stunning views of New York City and the local industrial landscape. At night, the Newtown Creek digester eggs' dramatic lighting reminds all who see them of their elegant combination of engineering and art.